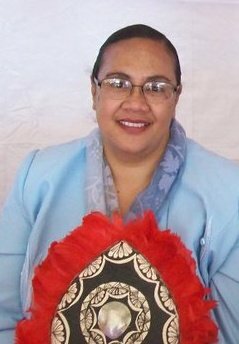 Pastor Kalesita was born and raised on the island of Tonga in the South Pacific. When she was 13 years old, her family moved to Hawaii and settled on the North Shore of Oahu where her father served as the local pastor for Kahuku UMC. She is the third child of four children, and one of three who are presently serving as pastors in the California Pacific Annual Conference. Pastor Kalesita completed her undergraduate studies in Financial Economics from the University of Hawaii and graduated from Hawaii Pacific University with Master of Information Systems. For twelve years, she worked as a Compliance Officer for the Bank of Hawaii. Similar to the story of Jonah, God called Pastor Kalesita but she wasn’t listening until she experienced a tragic incident in life and finally recognized His voice and answered, “Here I am Lord.” In 1999, Pastor Kalesita moved to Claremont School of Theology to begin formal study for professional ministry. After three years, she graduated from theology school with an emphasis on preaching and pastoral care. Pastor Kalesita was commissioned at our 2002 Annual Conference and appointed to her very first church at Holtville United Methodist at the border of San Diego and Mexicali. In July of 2005, she was appointed to serve a two-point charge in the San Fernando Valley; Sun Valley UMC (Tongan ministry) and Trinity United Methodist of Arleta (English speaking congregation). In July of 2009, she was appointed to serve a two-point charge with Sun Valley UMC and Knollwood UMC. Throughout her seven years of ministry, Pastor Kalesita has experienced God’s way of calling her to teach and preach the life changing Word of God.She truly believes that the church is the place where you can experience the life changing power and presence of God. For her, the purpose of the church is to meet the needs of the community, as well as to lead people in establishing a personal relationship with Christ.The church is the place where we can use our unique gifts to make a difference and change lives. With open hearts, open minds and open doors, we can be the hand and feet of Jesus to teach, heal and love all people. Our love for God and the people of God leads the church to develop ministries and outreaches that demonstrate that love. Some of her hobbies include reading, outdoor activities, and spending time with her family. She is a gracious and loving person who enjoys being with people and sharing her faith in Christ. Together with husband, Sione (John), they have five beautiful children. Pastor Kalesita has served as a member of the Board of Higher Education, the Racial Ethnic Committee and the Media and Communication Committee of the Conference. Throughout her time of ministry and service in the church, she has been asked to be guest preacher, teacher and workshop leader in various churches throughout the conference.